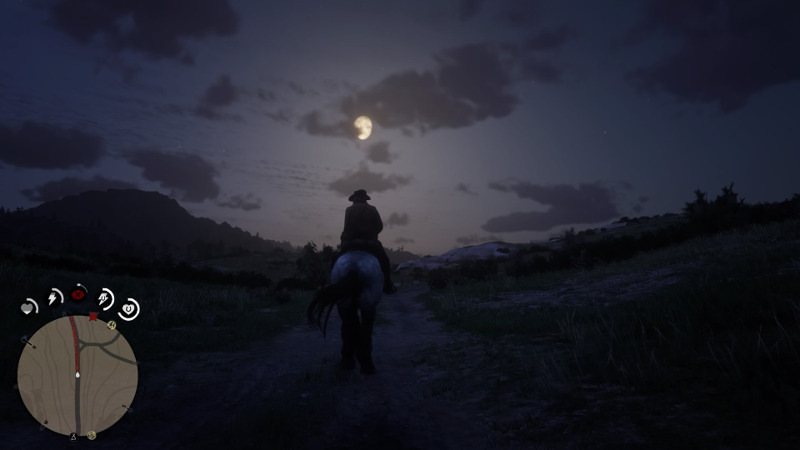 Last week, the week that marked the release of Red Dead Redemption II, one of the most anticipated games of the year, I tried my darndest to stay away from spoilers. I had seen all I needed to know from Rockstar’s trailers and gameplay teasers. But between the “100-hour work weeks” controversy surrounding Rockstar and the way the Internet works generally, it was a futile venture. 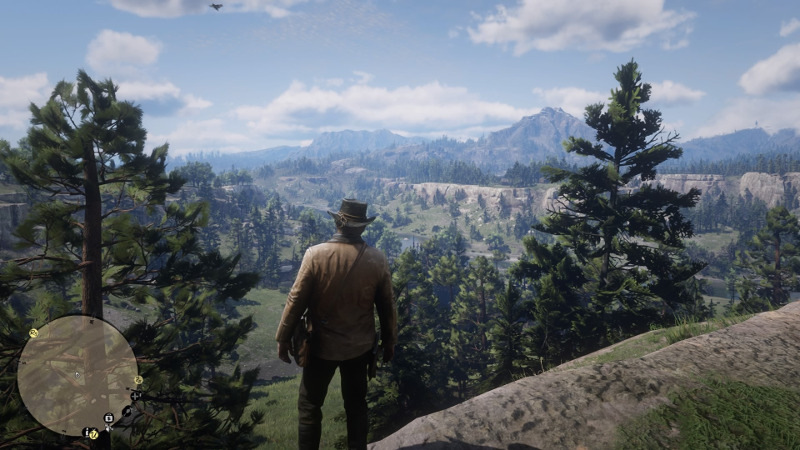 By the time I actually started up the game for myself late Friday night, I knew that critics had raved, almost unanimously so, that RDRII was a masterpiece, a perfect game, a game unlike any of Rockstar’s previous output and distinct from all other games of this generation. I also knew that players felt both the same and, well…otherwise. I really shouldn’t have taken that quick glance at my Twitter feed before I started playing, but what else was I supposed to do while the game was installing its nearly 100 GB load? The very basic sense that I got from fans was that the game was beautiful but slow story-wise and a little wonky control-wise. It seemed that some things from the original game had been fixed, but some problems remained, and some issues were altogether new. But these comments came from folks who had already delved deep into whatever the game offered. I only had a handful of hours to play over the weekend, and I think I logged somewhere around seven, or whatever would be the equivalent of completing a little over fifteen percent of the game’s main story. The following may contain minor spoilers. The game is tense from the get-go. 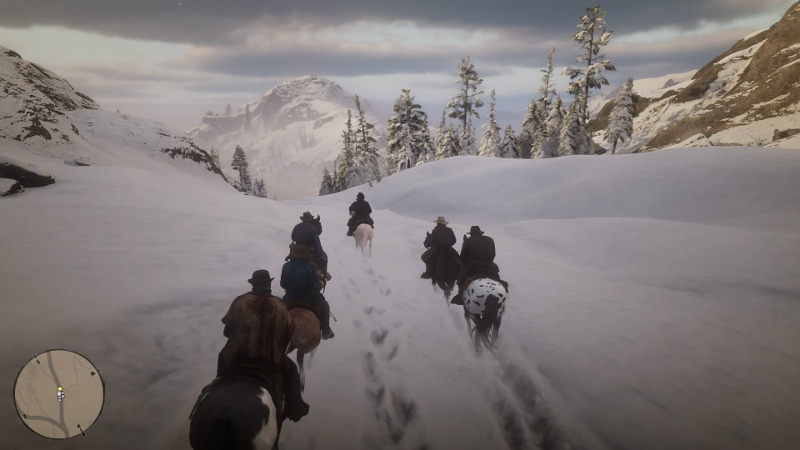 The van der Linde gang, headed by the charismatic and forceful Dutch van der Linde, has made a break from the law and has ended up in a desolate and very snowy region. Survival is the primary goal. The player’s character, Arthur Morgan, is exactly as he appeared in all those Rockstar videos – he’s rough, gruff, and has seen a thing or two…and he’s completely devoted to the gang. So when he’s asked to help hunt for food for the gang, he does. When Dutch catches wind of a nearby settlement of the rival O’Driscoll gang, Morgan doesn’t question the choice to take down the whole operation, guns blazing. When gang member John Marston gets himself into a terrible fix on the side of a wolf-strewn mountain, Morgan reluctantly rides in to save his sorry hide. Life with Dutch is always interesting, and always exhausting. Which may explain why Morgan is slow. Not mentally – he’s sharp as a tack and witty to boot – but physically. Hoo boy, Mr. Morgan is not in a hurry to get anywhere. It’s a tad odd, too, because his running speed is respectable. But at this early stage of the game, running saps his stamina quickly, so without a horse, it’s all walking, very slooooooow walking, at that. And it’s not like I’m in a hurry, but watching Morgan literally mosey from point A to point B can be a little…boring? I’m not sure of the right word. It’s just a little unusual, is all. And along the same lines, controlling Morgan during tasking is oddly frustrating. You have to line him up just right in front of whatever it is he needs to interact with, and then once you think got him set and hit the right button, there’s a pause and an extra animation of him moving to access whatever it is he’s supposed to access. I guess his movement looks more “real” in a sense, but in a game where the in-between time is slow(ish) to begin with, having Morgan move and interact at a snail’s pace isn’t very helpful. With the change of the seasons, the group eventually decides to seek out lower ground. The mountain camp is packed up, and their wagon train stops in a docile, forested spot called Horseshoe Overlook. The place is utterly gorgeous and the horizon looks limitless. Spring is blooming, flowers and trees and wildlife abound. Morgan eases into camp life, taking on chores, contributing to general camp provisions, and chatting with folks, those people that he likes, along with the ones he doesn’t. (Oh yes, there are a few gang folks with whom he does not see eye-to-eye, including the young and brash Mr. Marston.) He joins in on a trip to the nearby town of Valentine…where he summarily ends up in a bar fight that spills into the town’s extremely muddy streets. (A later visit to the same bar with gang member and friend Lenny would prove much more…err…eye-opening.) Morgan finds more civilization another town called Strawberry. Unfortunately, the townsfolk aren’t all that civil to him, especially after he breaks out gang member Micah, a hot-headed scoundrel, from its prison. The also gang takes on yet another O’Driscoll hideout at Dutch’s behest, and this time with the help of an O’Driscoll “informant,” who Morgan ends up befriending, reluctantly. And when he’s not tackling group assignments, Morgan takes to himself, collecting debts for the camp, tracking animals, and generally exploring the lands on horseback. But he has to be careful in the wilds, because danger lurks around every corner, whether in the form of the O’Driscolls or bounty hunters looking for his head from when, in town, he stole that horse from no one so he didn’t have to walk back to camp but someone still tattled. Busy times are busy for Mr. Morgan in 1899. And they’re pretty darn busy for the players, what with the patience it takes to learn the game’s complex control scheme. “Complex” may be overstating things, and to be fair, the first game had the same issues, but honestly, when the controls went awry, I couldn’t tell if it was me or the game. There were moments where pushing the L2 button to aim my gun did nothing, even though I could clearly see Arthur’s gun in his hand. Because I couldn’t figure out how to holster a weapon, I accidentally caused a riot during a stealth mission. Twice now I’ve had to lasso targets from horseback, only to end up running straight over my captures with my horse and un-lassoing them in the process. Speaking of which, doing pretty much anything from horseback remains awful, especially shooting (much like in the first game or in trying to shoot from a car in Grand Theft Auto V). Making the game’s horses realistic does not make them any easier to control. I’ve already accidentally flung mine and myself off a well-hidden bluff. That was fun. I’ve also accidentally punched it as well as some random strangers, because the controls just aren’t that intuitive generally. Gosh, and I haven’t even talked about the item management system, which is just as awkward to use as weapon wheel, only less organized and more confusing. The other night, my husband asked me if I thought Red Dead Redemption II was “fun.” I immediately said, “no, but it’s a fascinating game.” It truly is, but it’s not a joy to play. (In fact, the original game wasn’t a playground romp, either.) RDRII is an amazing, challenging, intense, and deliberate game. It’s much more than an Old West version of GTAV, and it really is unlike anything from Rockstar’s catalog that I’ve played before. It’s difficult and mature, slow and beautiful, and it relishes its own realism, almost to a fault. I feel that the drawbacks I’m experiencing now will eventually fade once I become more used to the game’s controls. Or, that’s what I hope will happen anyway. I remain unsure of what to make of Arthur Morgan. Weary outlaw, drunken brawler, heartbroken louse, ambivalent hero – whatever he becomes to me, I’m sure he’ll be memorable enough. All I know for now is that there’s a long road ahead in RDRII, and I cannot wait to see where the journey leads. All images, including lede, © Rockstar Games (2018). They were captured by the author on the PS4 during gameplay. I’ve been waiting for Red Dead Redemption II for a LONG time (along with everyone else). And now that I have it, what do I think? So glad you asked! See here on Virtual Bastion for first thoughts on my new adventures in the Old West. I’m enjoying the game quite a bit, but it feels held back by odd design decisions. You have to hold the button down for two seconds to pat your horse but you can spend hundreds of dollars or shoot someone in the face with a single accidental button click? Even basic things like saving the game just seem a bit sloppy. Beautiful game, but it definitely has some issues. You got that right! Interactions in the game are either unnecessarily convoluted or way too easy to mess up. I’ve punched my poor horse too many times because the melee button is the same one you use to tell the horse to flee. I’ve started completely avoiding the random roadside interactions because several times now I’ve accidentally started gunfights in the middle of trying to diffuse things. And then, despite the fact that my “crime” happened with no visible witnesses, it still somehow ends up being reported? It’s all so bizarre in an otherwise amazing game.